The fine brings Google’s total tab with the European Union to €8.2 billion in less than two years. THE EU’S POWERFUL anti-trust regulator has fined Google €1.49 billion for advertising violations. 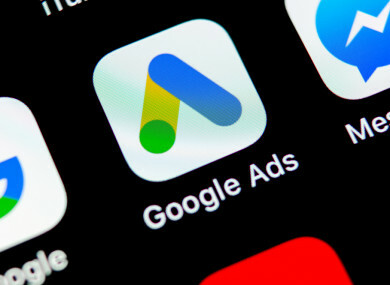 In its third major decision against the search engine giant, Brussels sanctioned Google’s once popular AdSense advertising service, saying it illegally restricted client websites from displaying ads from ad service rivals. Google and the EU have been at loggerheads about the monopoly of Google over internet searches in Europe since 2009 and the AdSense case was the only complaint still open. “Today the commission has fined Google €1.49 billion for illegal misuse of its dominant position in the market for the brokering of online search adverts,” EU Competition Commissioner Margrethe Vestager said. The fine brings Google’s total tab with the EU to €8.2 billion in less than two years, which amounts to far less than the maximum fine of 10% of Google’s annual turnover, Vestager said. In July 2018, the US giant was ordered to pay a record €4.34 billion for abusing the dominant position of Android, its smartphone operating system, to help assure the supremacy of its search engine. A year earlier the EU slapped Google with a fine of €2.42 billion for abusing its dominant position by favouring its ‘Google Shopping’ price comparison service in search results. Responding to this latest ruling, Google public affairs chief Kent Walker said the company had “already made a wide range of changes to our products to address the Commission’s concerns”. “Over the next few months, we’ll be making further updates to give more visibility to rivals in Europe,” he said. Hoping to end the decade-long dispute, Google yesterday unveiled a series of tweaks to its European search engine results that would allow certain rivals a more prominent position on results pages. The cases against Google, as well as a landmark €14.3 billion euro tax decision against Apple, thrust the former Danish minister into the spotlight as a champion of fighting US dominance. Commissioner Vestager landed her latest verdict on the eve of her announcement to be part of a team of candidates that will lead the European elections campaign for the liberal ALDE movement. She is the most prominent member of the team that will be appointed tomorrow by the heads of state and government linked to ALDE. “I will be active in the coming months to see if I can enable more voters to go and vote,” Vestager told a press briefing. Email “EU fines Google €1.49bn for blocking ads by rivals ”. Feedback on “EU fines Google €1.49bn for blocking ads by rivals ”.